The ancient manor of Bampton, on the banks of the Thames between Faringdon and Witney, Oxfordshire, was an important royal settlement as early as the 8th century. Bampton village itself, one of the oldest in England, was once a classic ‘monastic town’ formed around an Anglo-Saxon minster, and owned by the Dean and Chapter of Exeter for 900 years from the 11th to the 19th centuries. Today, Bampton’s historic status is underlined by the clutch of important houses that surround the church and, further north, by the imposing, 18th-century Manor House (pictured), which will be launched on the market in next week’s Country Life, at a guide price of £3.85 million through Knight Frank (020-7629 8171). From the 17th century on, Bampton saw a flurry of rebuilding, initiated by a small but significant group of prosperous local landowners. They were joined in the 18th century by a growing band of lawyers, among them Gascoyne Frederick, who held the lease of Bampton Manor, and whose name appears on the stables with the date 1755. Originally a farmhouse, it became the manor house in the 1620s when William Hanks, formerly of Aston, settled in Bampton. Thereafter, it was occupied successively by Hankses, Fredericks and Whitakers and was substantially rebuilt, probably by Edward Whitaker, in about 1806. The Whitakers bought the freehold of much of the manor estate from the Church Commissioners in 1866. In 1669, the house was a modest, two-storey affair, but by 1767, it boasted a main north-south range with projecting east wings. Early in the 19th century, presumably after Edward Whit-aker complained that the house would have to be ‘nearly all taken down and rebuilt’, the main range was replaced by a large three-storey block with a hipped, Stonesfield-slate roof. To maintain the symmetry, the remodelled 17th-century cross wings were retained at either end of the house. At the same time, the southern cross wing was extended to create a south entrance front, with a central doorway standing at the base of a three-storey stair tower. In the late 19th century, the arcaded entrance porch was replaced by the present Gothic porch, and the tall round-headed window above it by an oriel. Finally, in 1904-5, following an infestation of dry rot, the Victorian west wing was replaced by a raised, single-storey wing with larger windows and a parapet, to create a more or less symmetrical south front. In 1947, the German-born Countess Münster bought the Manor House, living there until her death in 1981. In 1982, the 8th Earl of Donoughmore bought the house-by then in need of considerable repair-moving in with his family in 1983, although the work continued for ‘another 10-15 years’. The 15,339sq ft Manor House, listed Grade II, has four main reception rooms, a kitchen/breakfast room, a billiards room, a large master suite, eight further bedrooms and five further bathrooms. It stands in 4½ acres of wonderful gardens and grounds, and comes with a three-bedroom cottage, outbuildings, garages and green-houses, a tennis court and a heated swimming pool. They say that gardens tend to die with their owners, but not here, for the manor’s enchanting gardens (Country Life, September 7, 1967, and July 31, 1986) were beautifully laid out by Countess Münster, and Lord Donoughmore saw little reason to tinker with their design. The gardens, a mix of formal and informal areas separated by yew hedges and stone walls, lie mainly to the south and east of the house, enclosed by the reputed mile of stone walling that surrounds the property. 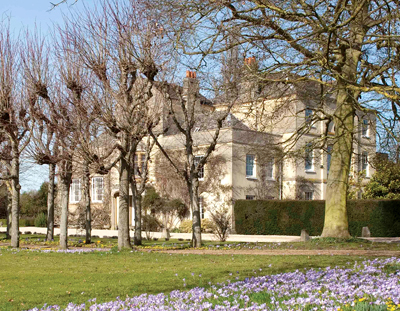 The recent bad weather that has delayed the onset of spring has worked well at Bampton Manor this year, for only now are its 10 million crocuses in full flower, whereas normally they would have all been finished several weeks ago. The original Manor House at Lower Woodford, near Salisbury, Wiltshire, was an official residence of the Bishop of Salisbury in the 12th, 13th and 14th centuries, but by the early 1500s, it was in a ruined state and was pulled down. The present Manor House, which dates from the late 17th century, with 18th- and 20th-century additions, was let on lease from the mid 17th century until 1869, when it was transferred to the Ecclesiastical Commissioners, who sold it with 810 acres in 1920 to the Hon Louis Greville, owner of the neighbouring Heale estate. The estate later passed to his niece Mrs Rasch, who transferred the property to her son. Since then, both Heale House and Lower Woodford Manor have been owned by the Rasch family, which is now selling the manor at a guide price of £2.25m, through Wiltshire agents Birkmyre (01672 564401). Built in two storeys of red brick with stone dressings, the manor-a scaled-down version of its grander neighbour-sits in a glorious private setting on the banks of the Avon, four miles north of Salisbury. The house, which has been let for some years and needs updating, stands in 4.3 acres of gardens and paddock, with additional land available by separate negotiation. It has four reception rooms, six bedrooms and three bathrooms, plus an outbuilding with planning consent for conversion to a cottage.